GM Viktor Korchnoi Viktor Lvovich Korchnoi (also spelled Kortschnoj, Korchnoy, Kortchnoy, Kortchnoi, etc.) was born on March 23, 1931, (several sources say July 23, 1931) in Leningrad. It was during Stalin's first five-year plan. His mother was Jewish and his father was Polish-Catholic. His mother was a pianist who had studied at the Conservatoire. His father, Lev (1910-1941), was a teacher of Russian language and literature. He was also a refrigeration engineer who made ends meet by working in a candy factory. He hailed from the Polish nobility. Viktor grew up in a 13-room communal flat shared with 10 other families. The Korchnoi family broke up soon after Viktor's birth. Viktor's father soon remarried. Finding it impossible to make ends meet, his mother was forced to hand Viktor over to her ex-husband. Viktor was initially raised by a Polish grandmother who arranged for him to be baptized a Roman Catholic. In 1937, at the age of 6, Viktor learned chess from his father. In November, 1941, Viktor Korchnoi's father was killed in combat on Lake Ladoga, east of Leningrad. He was part of a volunteer defense unit. Viktor Korchnoi survived the 872-day siege of Leningrad only because he was able to use the ration cards of his father, grandmother, uncle, and great-uncle, after they were killed as the front, starved, or froze to death. Over 750,000 people died during the siege of Leningrad. Viktor was raised by his step-mother. In 1943, at the age of 12, Viktor joined the chess club of the Leningrad Pioneers' Palace (youth club). His first coach was Candidate Master Abram Model (1896-1976), who had formerly been a trainer of Mikhal Botvinnik. Other coaches and trainers included master Andrei Batuyev (a grand-nephew of Lenin) and Vladimir Zak (who also coached Boris Spassky). Viktor was involved in three pursuits at the same time while at the Pioneers' Palace — chess, piano, and literary reading. He soon devoted all his energies to chess. By early 1946, Korchnoi went from fifth category to first category rating in the USSR. He then played in the 1946 Leningrad Youth Championship, but failed to win it. In 1946, he took 11th place in 5th USSR Junior Chess Championship (scoring 5 out of 15), won by Candidate Master Tigran Petrosian. In 1947, at the age of 16, Viktor won the 6th USSR Junior Chess Championship, which was held in Leningrad. He scored 11.5 out of 15 without losing a single game. In 1948, Korchnoi finshed high school and enrolled at Leningrad University and majored in a six-year course in History. He rejected the sciences as demanding too much labor, and he wasn't good at physics. In "Chess is My Life," he wrote, "All this time, instead of studying history, I was given an extended course in Marxism." He wished he had enrolled in a modern languages course. In 1948, Viktor tied for 1st with Ivo Nei (1931- ) in the 7th USSR Junior Championship, which was held at Tallinn, Estonia. In 1949, a Leningrad youth team consisting of Korchnoi , Boris Spassky, and Lutikov took 1st place in the Youth Team Tournament of the USSR. He scored 5 out of 6 on board 1. For his success, Korchnoi was awarded the title of Candidate Master. In early 1950, Korchnoi took 2nd place in the Leningrad championship, won by Mark Taimanov. It was his first major success in adult chess tournaments. In October 1950, Korchnoi took 13th place in the semifinals of the 18th USSR championship, held in Tula. In early 1951, he took 6th place in the Chigorin Memorial, held in Leningrad. The event was won by Vasily Smyslov. In 1951, at age 20, he took 2nd in the 1950 Leningrad Championship (won by Taimanov) and earned the title of Soviet Master (Master of Sport No. 3901). At the time, he was the youngest of 50 Soviet chess masters. In 1952, he took 4th place in the Leningrad Championship, won by Taimanov. In December 1952, he took 6th place (ahead of Smyslov, Bronstein, Keres, Suetin, and Simagin) in the 20th USSR championship, held in Moscow. Botvinnik defeated Mark Taimanov in a playoff to win the event. In 1953, he took 2nd in the Leningrad championship, won by Furman. In June 1953, he took 3rd place in the 21st USSR semifinal championship, held in Vilnius. The event was won by Kholmov. In the summer of 1953, he won the championship of the student society Nauka," scoring 14 out of 16. In February 1954, he tied for 2nd place with Taimanov in the 21st USSR championship, held in Kiev. Yuri Averbakh won the event. In the spring of 1954, Viktor won his first international tournament when he took 1st place in Bucharest, Romania. For his performance at Bucharest, Korchnoi was awarded the International Master (IM) title from FIDE during it August meeting. In April 1954, Korchnoi played board 1 for the USSR in the World Students' Team Championship in Oslo. In 1954, Viktor graduated from Leningrad State University with a major in history. His thesis was titled: "The Popular Front and the Communist Party in France on the eve of the Second World War." In March 1955, he took 19th place out of 20 in the 22nd USSR championship, held in Moscow. He only won one game, to the last place finisher. It was his worst performance in chess. In May 1955, he won the 28th Leningrad Championship, scoring 17 out of 19. He was 3 points ahead of the 2nd place finisher, Tolush. He had won 11 games in a row. In 1955-56, he tied for 1st with Fridrik Olafsson at the Hastings International Chess Congress. In February 1956, he took 4th place in the 23rd USSR championship, held in Leningrad. He was awarded the USSR grandmaster title. He was the 18th person to receive the USSR GM title. In September 1956, he was awarded the Grandmaster title, along with Bent Larsen and Alberic O'Kelly de Galway during the FIDE Congress. In February 1957, he shared 7th place with Petrosian in the 24th USSR championship, held in Moscow. Mikhail Tal won the event. In June 1957, Korchnoi tied for 1st with Semyon Furman in the 30th Leningrad championship. In August 1957, he won the gold medal on board 8 at the European Team Championship, held in Vienna. In February 1958, he took 10th place in the 25th USSR championship, held in Riga. The event was won by Mikhail Tal. In 1958, Korchnoi married an Armenia lady named Bella (Isabella). In 1958, Korchnoi played board 1 for the Leningrad team, which took 2nd place in the USSR team championship, held in Vilnius. In February 1959, he took 9th place in the 26th USSR championship, held in Tbilisi. The event was won by Tigran Petrosian. In September 1959, he won at Cracow, Poland, scoring 8.5 out of 11. In February 1960, he won the 27th USSR championship, held in Leningrad. He won 12, lost 3, and drew 4. Geller and Petrosian score œ point behind Korchnoi. In 1960, Korchnoi tied for 1st place with Samuel Reshevsky in Buenos Aires. Bobby Fischer tied for 13th-16th place, his worst tournament. In November 1960, the USSR team (Tal, Botvinnik, Keres, Korchnoi, Smyslov, Petrosian) won the 14th Chess Olympiad at Leipzig (their 5th consecutive gold medal). Botvinnik invited Korchnoi to join him for some brandy. Botvinnik told Korchnoi, "It's good stuff — like your wife." Korchnoi responded, "No, it's an old cognac — like your wife." In February 1961, he took 2nd place in the 28th USSR championship and Zonal (Zone 4) qualifier, held in Moscow. That gave him his first invitation to an Interzonal. Petrosian won the event. The Zonal qualifiers to the Interzonal included Petrosian, Korchnoi, Geller, and Stein. Smyslov and Spassky failed to qualify. In March 1962, he tied for 4th place in the 23-player Stockholm Interzonal (won by Fischer by 2 œ points). Korchnoi advanced to the Candidates' Tournament. In June 1962, he took 5th place at the 8-player Candidates' Tournament in Curacao, won by Petrosian. Korchnoi took the early lead, scoring 5 out of 7 in the first cycle. But in the 12th round, Korchnoi blundered against Bobby Fischer in a winning position and lost, and soon after lost 4 games in a row. In 1962, Bobby Fischer (1943-2008) complained that the Russian prearranged draws against each other in order to conserve energy for play against him. Fischer's article "The Russian Have Fixed World Chess," appeared in Sports Illustrated. This led to the tournament system being scrapped in favor of a series of elimination matches. Years later, Viktor Korchnoi confirmed that the Soviet players were cheating and ganging up on Westerners in tournaments and throwing key games when necessary, including at Curacao. In December 1962, he won the 30th USSR championship in Yerevan (10 wins, 1 loss, and 8 draws). Taimanov and Tal tied for 2nd place. In September 1963, he won the 2nd Capablanca Memorial at Havana. In December 1963, he took 10th place in the 31 USSR championship, held in Leningrad. In 1964, Korchnoi won the 37th Leningrad championship. In 1964, he tied for 5th place in the 1964 USSR Zonal tournament in Moscow and did not qualify for the Interzonal. In January 1965, he won the 32nd USSR championship in Kiev. He won 11, lost none, and drew 8. In 1965, Korchnoi joined the Communist Party. He thought it would help him play more chess tournaments outside the USSR. In 1965, he scored 14.5 out of 15 at Guyla, Hungary. In December 1965, he took 11th place in the 33rd USSR championship, held in Talinn. Stein won the event. In May 1966, he won at Bucharest and at the Chigorin Memorial at Sochi in July. In November 1966, Korchnoi won the gold medal on 1st reserve board at the 17th Chess Olympiad, held in Havana. He scored 10.5 out of 13 (80.8%). The Soviet team (Petrosian, Spassky, Tal, Stein, Korchnoi, and Polugaevsky) won the event. In February 1967, he tied for 3rd place in the 34th USSR championship, held in Tbilisi. The event was won by Stein. In November 1967, Korchnoi tied for 2nd with Geller and Gligoric at the Interzonal at Sousse, Tunisia. Bent Larsen won the event. Korchnoi qualified for the Candidates' matches. In September 1968, Korchnoi lost to Boris Spassky in the Candidates' final match, held in Kiev. Earlier, he had defeated Samuel Reshevsky (held at Amsterdam in May) and Mikhail Tal (held at Moscow in June-July). In the late 1960s, Korchnoi was the third best player in the USSR, after Boris Spassky and Tigran Petrosian. In November 1968, he won a gold medal for his board at the Lugano Chess Olympiad. In December 1968, he won at Palma de Mallorca. In 1969, he won at Sarajevo and at Luhacovice. In 1969, Korchnoi tied for 1st with Alexei Suetin in the 7th Capablanca Memorial, held in Havana. In 1970, FIDE published its first official chess rating list. The top player was Bobby Fischer, rated 2720. Next came Boris Spassky and Viktor Korchnoi, both rated 2670. In April 1970, he played on the USSR team in the USSR vs. The Rest of the World. The event was held in Belgrade. Kochnoi drew 3 and lost 1 to Portisch. On April 8, 1970, Korchnoi took 3rd place in the Herceg Novi blitz tournament, won by Bobby Fischer. Fischer's only loss was to Korchnoi. In May 1970, he tied for 2nd at Rovinj/Zagreb. The event was won by Bobby Fischer. In September 1970, at the Chess Olympiad in Siegen, Korchnoi overslept and lost his game by default against Spain, his only loss. The round started at 3 pm and he was unable to make it to his game by 4 pm. In December 1970, he won the 38th USSR championship in Riga. He won 12, lost 1, and drew 8. It was his 4th USSR championship title. In January 1971, he won at Wijk aan Zee. In July 1971, Korchnoi lost to Tigran Petrosian in the semifinal Candidates' match (9 draws and 1 loss for Korchnoi). He defeated Geller earlier in the quarter-final match in June. Anatoly Karpov claimed that Korchnoi had deliberately lost to Petrosian on the orders of the USSR Sports Committee. The USSR Sports Committee thought that Petrosian had a better chance in stopping Bobby Fischer than Korchnoi. In December 1971, he took 11th place in the Alekhine Memorial in Moscow. Karpov and Stein tied for 1st. In 1971/72, Korchnoi tied for 1st with Anatoly Karpov at the Hastings International Chess Congress. In June 1972, he took 2nd at the IBM International in Amsterdam. In 1972, Korchnoi won the gold medal on board 2 at the 20th Chess Olympiad, held in Skopje, Yugoslavia. The USSR team (Petrosian, Korchnoi, Smyslov, Tal, Karpov, and Savon) won the event. In December 1972, he tied for 1st with Panno and Smejkal at Palma de Mallorca. In 1973, Korchnoi appeared in a Russian movie called "Grossmeister." He played a role as a chess trainer to a boy who became world champion. In June 1973, Korchnoi tied for 1st place with Anatoly Karpov in the Leningrad Interzonal. He, again, qualified for the Candidates' matches. In October 1973, Korhnoi took 3rd place in the 41st Soviet Championship, held in Moscow. The event was won by Boris Spassky, followed by Anatoly Karpov. In February 1974, Korchnoi defeated Henrique Mecking at Augusta, Georgia (the first Candidates' match ever held in the USA), and Tigran Petrosian at Odessa in April in the Candidates' matches. He later lost to Anatoly Karpov (who earlier defeated Spassky) at the Hall of Columns in Moscow in November (Korchnoi won 2, lost 3, and drew 19 games with Karpov). With Fischer's withdrawal from the world championship match, the Korchnoi-Karpov match determined the next world chess champion. In December 1974, Korchnoi criticized Anatoly Karpov in an interview with Bozidar Kazic and a Yugoslav newspaper called "Politika." Korchnoi said that Karpov did not show any superiority over his Candidates opponents. Korchnoi also said that Fischer world championship match was justified. Because of these statements, Korchnoi was not allowed to play chess outside Eastern Europe for two years. His monthly stipend was reduce from 300 to 200 rubles. He was also banned from appearing on any TV broadcast and from lecturing. His apartment was most likely bugged. From 1954 to 1974, Korchnoi won 21 medals playing in team events (Student Olympiads, Chess Olympiads, etc) representing the USSR. In 1975, Korchnoi played Garry Kasparov for the first time when Kasparov was 13. The event took place in Leningrad. Korchnoi was giving a clock simul. The game was a draw. In November 1975, he took 4th in the Alekhine Memorial, held in Moscow. It was the first international event that Korchnoi could play in after his suspension. In 1975/76, he took 4th place at Hastings. In July 1976, Korchnoi (ranked No. 2 in the world), age 45, tied for 1st place at the IBM International in Amsterdam, along with Tony Miles. At the end of the tournament on July 27, Korchnoi defected and asked for Dutch political asylum (he had to ask Tony Miles how to say and spell "political asylum"). Instead of flying to Frankfurt en route to the USSR after the tournament, he went to the Amsterdam police headquarters and asked for asylum. Korchnoi feared he would not be allowed out of the USSR again because of his criticisms of world champion Anatoly Karpov. Korchnoi was the first strong Soviet grandmaster to defect from the Soviet Union. He left his wife, Bella, and 17-year-old son, Igor, behind. Korchnoi first resided in the Netherlands (he had a six-month residence permit), then moved to West Germany for a short period. He finally settled in Wohlen, Switzerland (it took 15 years before he was granted Swiss citizenship). Bobby Fischer sent Korchnoi a telegram congratulating him for defecting from the Soviet Union. In September 1976, the USSR Chess Federation wrote an open letter condemning Viktor Korchnoi for his defection. It was signed by 31 Soviet grandmasters. Several players refused to sign the letter, including David Bronstein, Boris Gulko, and Mikhail Botvinnik. Because Bronstein refused to condemn Korchnoi, his pension was "reduced by 10 percent for disloyalty to the Soviet Union." After his defection, Korchnoi was boycotted by Soviet players, and his wife and son were refused permission to emigrate. In October 1977, Korchnoi met Petra (Hajny) Leeuwerik, who was born in Austria. As a 19-year old, she was kidnapped by the Russians in the Soviet zone of Vienna after World War II and was given a 20 year sentence in a Russian labor camp. The Soviets claimed she was a spy for the Americans. She served 9 years in the camp and had been tortured to confess that she was a spy. Viktor soon fell in love with her and married her after divorcing his first wife Isabella. In March 1977, Korchnoi defeated Tigran Petrosian in the Quarterfinals of the 1977 Candidates Tournament in Italy. Korchnoi accused Petrosian of shaking the table while it was his turn to move. Soon, they began kicking each other under the table. The organizers were then forced to separate them with a partition under the table. In July 1977, he defeated Lev Polugaevsky in France. On November 8, 1977, Korchnoi, age 46, was injured in a car wreck with a broken right hand and other injuries. Korchnoi's taxi collided with a Swiss army truck on its way to Zurich. The car rolled over three times. He asked for a postponement in his world championship semi-final match with Spassky. Raymond Keene was also a passenger, but not seriously injured. In January 1978, he defeated Boris Spassky in Belgrade and became the challenger for the 1978 world championship match. 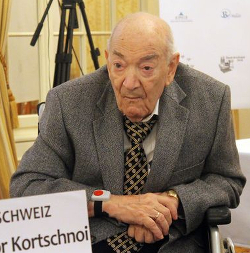 In 1978, Korchnoi settled in Switzerland and later became a Swiss citizen. The Soviet government denied his wife and son from leaving the country. The conditions of the 1978 World Chess Championship match were changed for the first time since 1951. Instead of a 24-game format, it was replaced with an unlimited game format, with the first player to win 6 games being declared world champion. Also, the rematch clause, which was discarded in 1963, was brought back into effect. In October 1978, Korchnoi (rated 2665) lost to Karpov (rated 2725) in the world championship match, held in Baguio, Philippines. Korchnoi brought his own chair in from Switzerland. The Soviets didn't trust Korchnoi, so they took the chair to a local hospital to x-ray it for any devices that might disturb Karpov. Nothing was found. The Soviets protested the right for Korchnoi to play under the Swiss flag since he was not a citizen yet. Korchnoi then offered to play under the Jolly Roger pirate flag. During the match, when Karpov's team sent him a blueberry yogurt during a game when Karpov had not requested one, Korchnoi and his team protested that it must be some kind of code (offer a draw, or make a particular move). Throughout the match, both players accused each other's teams of using hypnosis. Korchnoi played in mirrored glasses to shield his eyes from Karpov's psychologist (Dr. Vladimir Zukhar) in the audience. Korchnoi was down 5-2, but made a comeback to 5-5 before losing the final game (Karpov won 6-5, with 21 draws). Korchnoi had brought in his own "parapsychologist, neurologist, and hypnotist" to the match. Korchnoi employed the services of two members of an Indian religious sect, the Ananda Marga, then on bail for murder. Korchnoi did not resume the final 32nd game of the match. He wrote to the arbiter: "I shall not resume the 32nd game. But I am not going to sign the score sheet because the game was played under absolutely illegal conditions. I do not consider the game valid. The match is not finished. I reserve the right to complain to FIDE about the intolerable behavior of the Soviets, the hostility of the organizers, and a lack of activity on the part of the arbiters. Korchnoi boycotted the closing ceremony, thereby risking losing his portion of the $585,750 prize fund. When he did receive his check, FIDE President Campomanes wrote on it: "Subject to payment only if Korchnoi acknowledges the match is finished." I personally saw this note and Korchnoi's check when I interviewed him in Charlotte, North Carolina after the match. Korchnoi never did acknowledge that the match was finished. In November 1978, Korchnoi won the gold medal for board 1 at the 23rd Chess Olympiad, held in Buenos Aires. He played board 1 for the Swiss team. He won 7, drew 4, and lost none (81.8%). It was his 4th gold medal for individual play. At the end of 1978, Korchnoi won the "Chess Oscar" for Player of the Year. In 1979, Korchnoi's Elo rating was 2695, his peak rating. 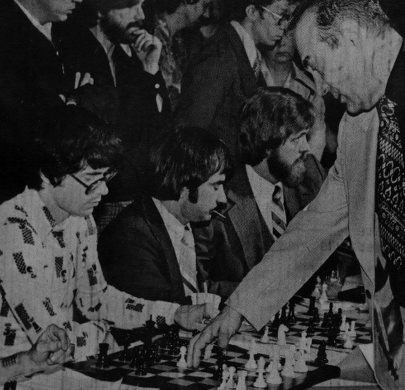 On March 23, 1979, Viktor Korchnoi came to Charlotte, NC to give a 50-board simul. I was President of the North Carolina Chess Association and was able to interview him and participate in the simul. Here is my game with him. I pretty well got strangled. In August 1979, Korchnoi tied for 1st place with L. Ljubojevic at the 3rd Konex Canon International Tournament in Buenos Aires. In March 1980, Korchnoi won the 9th Reykjavik International in Iceland. In 1980 to January 1981, Korchnoi defeated Petrosian, Polugaevsky, and Huebner to, once again, become challenger for the world championship. In March 1981, Korchnoi played at Lone Pine. He showed up without notice, which gave no time for the two Soviet players, Romanishin and Yusupov, to drop out. At the time, there was a Soviet bloc not to have any Soviet chess players participate in a tournament that Korchnoi was participating in. In 1982, Korchnoi lost to Karpov in the world championship match, held in Merano, Italy. Korchnoi won 2, lost 6, and drew 10. Shortly before the match, Korchnoi's son was arrested in the USSR and jailed attempting to emigrate. He was given a 30-month sentence in a labor camp in Siberia for refusing military service. In 1983, Korchnoi defeated Lajos Portisch at Bad Kissingen, but then lost to Garry Kasparov in London in the Candidates' matches. The Kasparov match was scheduled to be played in Pasadena, California, but the Russian chess federation would not allow Kasparov to travel to the USA. Korchnoi was the winner on default but agreed to replay the match in London after some better economic terms. In 1984, Korchnoi said that he played the ghost or spirit of Geza Maroczy, a Hungarian grandmaster who died in 1951 with the help of a psychic, Robert Rollans. Korchnoi said the game took 7 years to complete. Korchnoi said he won in 47 moves. In 1986, Korchnoi tied for 1st place with Alexander Beliavsky in the Vienna IBM International Tournament. Each was awarded $3,100. In 1988, Korchnoi lost his Candidates' match with Johann Hjartarson of Iceland. The match was held in Saint John, New Brunswick, Canada. From 1954 to 1990, Korchnoi played in about 70 international tournaments and won or shared first place 40 times. In 1990, Korchnoi's citizenship in Russia was restored to him, but he did not return. He said that the life expectancy was higher in the West, so he was going to stay in Switzerland. In 1991, Korchnoi lost to Jan Timman in the Candidates' matches. Korchnoi played in Candidates' tournaments and Candidates' matches from 1962 to 1991, or 29 years, more than any other chess player. In 2005, Korchnoi was still ranked in the top 100 in the world at the age of 74. In September 2006, he won the 16th World Senior Chess Championship at the age of 75. In 2007, he was ranked #85 in the world at age 75. In 2007, Korchnoi tied for 2nd in the National Open. In 2007, Korchnoi lost a game to Irina Krush in a tournament at Gibraltar. He left the playing area without saying anything, but then saw her analyzing the game with a friend. He went up to Irina and insulted her, saying, "It's good to know theory, but you should learn how to play chess as well." In 2009, he won the Swiss championship at the age of 78, becoming the oldest person to win a national championship. In 2011, at the age of 80, Korchnoi beat Fabiano Caruana who was ranked #5 in the world at the time. In July 2011, he won the Swiss championship at the age of 80. He was the oldest active grandmaster on the tournament circuit. In September 2012, Korchnoi suffered a stroke, but he still continued to play chess. In 2015, bound to a wheelchair, he played a match against German GM Wolfgang Uhlmann. In early 2016, he attended the 2016 Zurich Chess Challenge, but was not able to play himself. On June 6, 2016, Viktor Korchnoi died at the age of 85 in Wohlen, Switzerland. Korchnoi was USSR champion four times (1960, 1962-63, 1964-65 and 1970). He won five European Championship titles, two interzonal tournaments for world championship, and two Candidates Tournaments (1977 and 1980). The latter led to world championship challenges. Korchnoi played three matches for the title, all against Anatoly Karpov (1974, 1978, and 1981). He was the strongest chess player never to have won the world championship title. He was also World Senior Champion. Korchnoi played in ten Candidate tournaments (1962, 1968, 1971, 1974, 1977, 1980, 1983, 1985, 1988 and 1991). He won 6 team Chess Olympiad medals (USSR) and 7 individual medals (4 gold and 3 bronze). He played in 17 Chess Olympiads (1960, 1966, 1968, 1970, 1972, 1974, 1978, 1982, 1988, 1990, 1992, 1994, 2000, 2002, 2004, 2006, and 2008). He defeated three world champions in match play: Mikhail Tal in 1968, Tigran Petrosian in 1974, 1977, and 1980, and Boris Spassky in 1977.